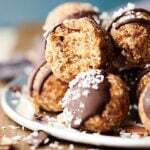 If you love this healthier twist on the classic treat, you’ll also love: vegan scotcheroos, whole wheat chocolate chip cookies, and monster cookie bites. Because I’ve been craving Reese’s Peanut Butter Cups like no other and I seriously needed a healthy alternative. PSST – If you’re not on the almond butter train or need a nut free version, feel free to use any “nut butter”: peanut butter, cashew butter, sunflower seed butter . . . you name it, it’ll probably be delicious. Easy! Trust me. They’re easier than getting in your car, running to the convenience store, and picking up a pack of Reese’s. Delicious! Your favorite brand of almond butter wrapped in a naturally sweetened chocolate mixture <— drooooool. While I’ll always have a special place in my heart for the classic, store bought peanut butter cup, I’m tellin’ ya, this homemade version is SO much tastier and will totally satisfy the craving. Line a mini muffin tin with mini cupcake paper liners. You’ll fill 12 of the slots. Whisk together melted coconut oil, cocoa powder, and maple syrup until smooth. Pour 1 teaspoon of the melted chocolate mixture into one liner. Use the back of the teaspoon to “paint” up the sides of the liner. Place muffin tin in the freezer to harden the chocolate. Take heaping 1/2 tablespoon almond butter and place it into the center of one of the chocolate slots. Top with another 1 teaspoon melted chocolate. Top with maldon sea salt. 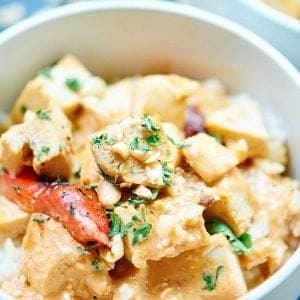 Serve, then store leftovers in an airtight container in the freezer. Naturally sweetened, sweet, but not too sweet homemade dark chocolate with rich, nutty, creamy almond butter . 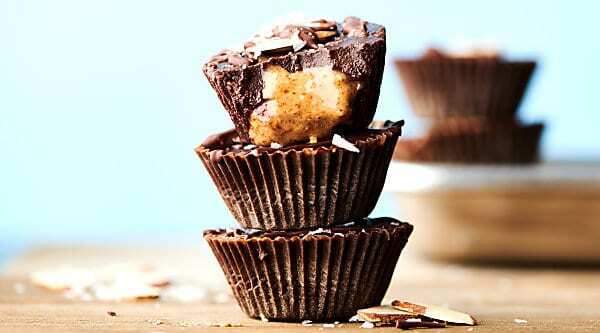 . .
Move over store bought candy, there’s a new nut butter cup in town! 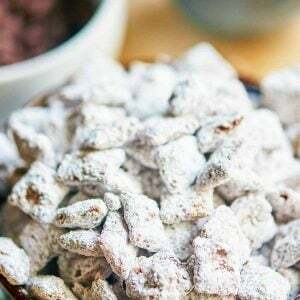 Do you want more homemade versions of classic store bought treats? Show Me the Yummy! Line a mini muffin tin with mini paper liners (you’ll need 12 slots). Set aside. 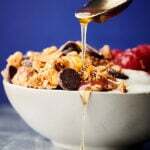 In a bowl, whisk together melted coconut oil, pure maple syrup, and cocoa powder until smooth. Microwave for an additional 30 seconds if the mixture isn’t smooth and runny. Spoon 1 teaspoon melted chocolate into one liner. Use the back of the teaspoon to “paint” up the sides of the liner. The inside of the liner should be completely covered in a thin layer of chocolate. This is messy and doesn’t have to be perfect. Place muffin tin in the freezer for 10 minutes, or until the chocolate has hardened. Top with 1 teaspoon melted chocolate (you’ll need to microwave the mixture again for another 30 seconds or so to re-melt). This should completely cover the almond butter and fill the cup. Peel the off the paper liners. You need to do this when they're frozen solid or you'll break the chocolate. *The longer you leave these in the freezer, the harder the chocolate (and almond butter inside) gets. I think the texture is perfect at about 6-8 hours. **Let them sit for about 5 minutes at room temperature before serving. **You can store these in the fridge, but then the chocolate won’t be as hard. 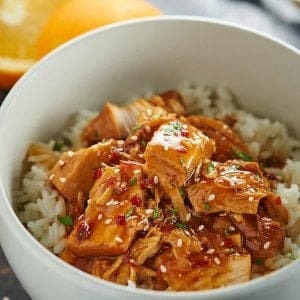 ***This recipe can easier be doubled, tripled, etc. Why not use olive oil which is a healthier fat than coconut oil. I don’t particularly care for the flavor of olive oil in desserts and the coconut oil hardens at room temperature or colder, which is great for the chocolate! Is it one cup per serving.